Evening is my time to unwind and pamper my skin. I reach for rich balms and oils, and layer them on until I'm gleaming. I literally do this in a caftan and turban at a sink my husband keeps covered in toothpaste and beard hair, but details, details. First things first, get that makeup off! I've tried so many face wipes, and the Acure Unscented Argan Oil Towelettes are the only ones that don't sting my eyes and skin. They take off my many layers of eyeliner and mascara with no problem, and are biodegradable. You can also use them on body. I keep a pack in my bathroom, nightstand, and gym bag. The African Botanics Pure Marula Cleansing Oil is a magnet for dirt, oil, and pollution. It's packed with oxygenating, exfoliating, and nourishing ingredients that do wonders for my skin. I massage onto a dry face with dry hands, then add water to emulsify the oil into a milk that rinses completely clean. You can also use this to remove your makeup, including waterproof mascara. You're probably wondering now why I start with a wipe. While an oil will do the job, if I let the wipe remove my makeup I can maximize the benefits of the cleansing oil. I'm a big believer in a toner step. Even when cleanser is gentle, a toner or softener can make a big difference in your skin texture, and the performance of your other products. 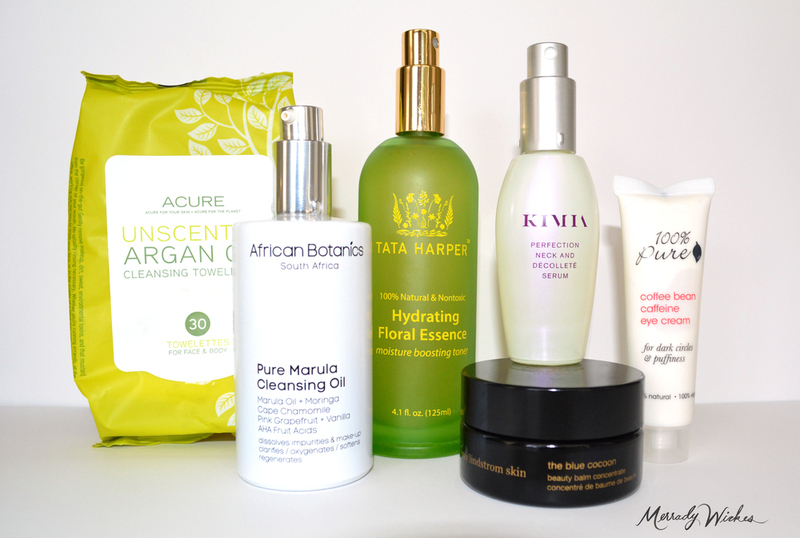 The Tata Harper Hydrating Floral Essence is perfect for my dehydrated skin. I either mist on liberally and press in with my palms, or spray onto a damp cotton pad and sweep over my skin. *Tip- Be sure to apply your moisturizer while your toner is still moist. You will use less, and it will glide on smoothly and dive deeper into your skin. May Lindstrom's Blue Cocoon is the most heavenly aromatic balm featuring healing Blue Tansy, also known as Moroccan Chamomile. The soothing blue balm melts into an oil that is great for irritated or inflamed skin. In my case, the balm is just the thing for my California drought alligator skin. I'm simultaneously oily and parched, sensitive and blemish prone. I'm treasuring this little jar and only scoop out the tiniest amount for my whole face and lips. Anything left on my hands gets rubbed into my cuticles. Kimia Neck and Décolleté Serum works to promote elasticity on the delicate neck and chest area. I apply this oil serum in gentle upward strokes all over the décolletage every evening. *Side note- A highly sought after bra fitter once told me that an ill fitting bra causes chest wrinkles! Most women wear a too loose band and a too tight cup. Do yourself a favor and get a professional fitting! And of course, eye cream. I'm very sensitive, and I find almost every eye cream irritating. The 100% Pure Coffee Bean Eye Cream is anti-aging, hydrating, and gentle. It also combats dark circles and puffiness. But most importantly, I don't wake up with irritation. The skin around our eyes is the thinnest on our face and shows signs of aging first. I've been using eye cream since I was 12, and religiously wear sunglasses outdoors even when it's overcast. The result? No crow's feet. If you've read my other posts you know I don't naturally have nice skin. My skin wants to be patchy, angry, and broken out, but I coax it into submission with my arsenal of carefully applied skincare. Check out my morning regimen here, and my weekly mask routine here.